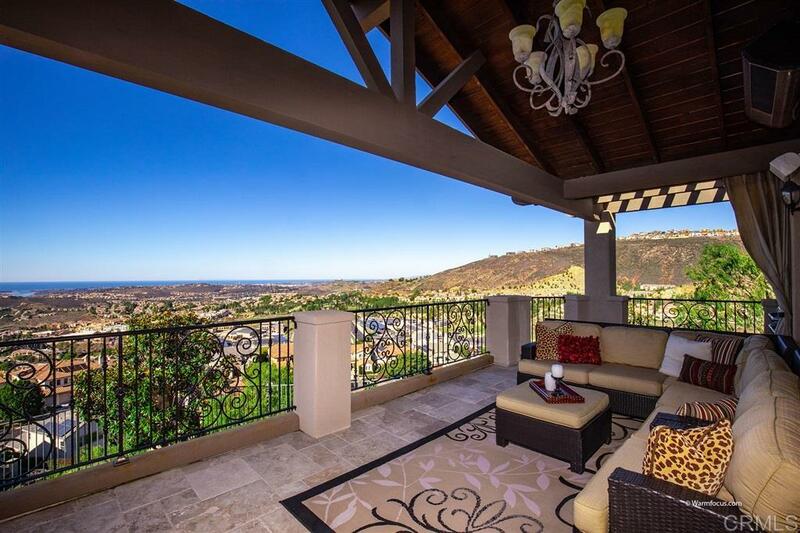 Located at the end of a cul-de-sac, on a premium lot with commanding panoramic ocean views, âPuesta del Solâ is a once in a lifetime opportunity. Set on one of the highest points in North County San Diego that overlooks downtown San Elijo Hills. With views from Dana Point to Catalina Island and south to downtown San Diego, this exquisite coastal residence stands at the apex of quality and style, with its extensive use of natural stone and hardwoods, luxurious outdoor living rooms and unrivaled area views., The refined, open interior features a sophisticated living room with volume ceilings, a formal dining room with bar area, and a unique floor plan that maximizes the home's idyllic location. Oriented to capture panoramic ocean vistas from all of the main living areas, the home offers an approximately 3,900 square foot interior, with 5 bedrooms, an office, bonus room and 3.5 bathrooms. An oversized family room/kitchen/breakfast room serves as the hub of the home. The family room has a fireplace and a built-in entertainment center; the open kitchen has a built-in refrigerator, dual ovens and a six burner gas range. Custom wood cabinetry, granite counters and a wrap-around breakfast bar add to the appeal, but the adjacent covered balcony is certain to be a favorite, as it has vaulted hardwood ceilings, stone floors, built-in heaters and endless views, from Dana Point to Catalina Island and as far south as downtown San Diego. With a romantic, ocean view balcony, a fireplace and a regal, spa-like bathroom with an oversized tub, leaded glass windows and stone floors, the master suite is a relaxing place to start the day. Impeccably designed and completed with meticulous attention to detail, the outdoor living areas include an ocean view spa with stone accents, a built-in fire pit, a bocce court, a grassy play space and an additional covered patio. An extensive remodel totaling nearly $175K transformed the home into the stunning, turnkey masterpiece that it is today. Further highlights include an oversized laundry room with a sink and custom cabinetry, an attached three car garage, stacked stone exterior accents, professional landscaping, solar panels and large secondary bedrooms and office. Located nearby everything San Elijo Hills have to offer, including 19 miles of hiking trails, award-winning parks and schools, numerous restaurants and shopping centers, this home is the ultimate legacy property.